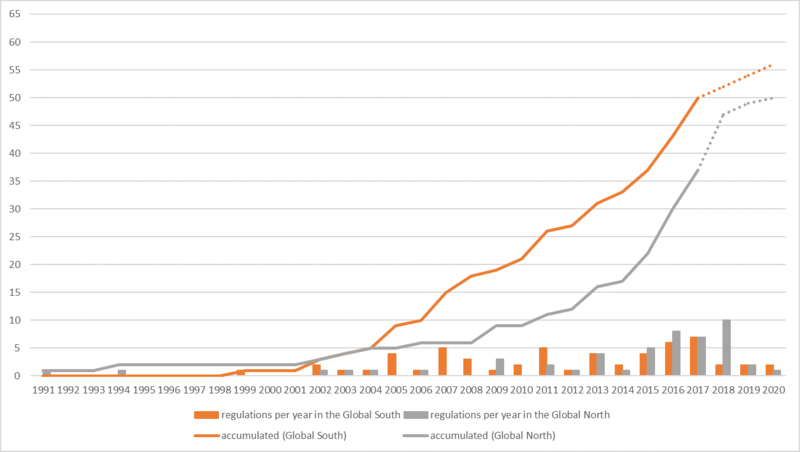 While diffusion patterns are quite well understood in the context of the Global North, diffusion research has only been applied to a limited extent to investigate how policies spread across developing countries. In this article, Ecologic Institute's Doris Knoblauch, Linda Mederake and Ulf Stein therefore analyze the diffusion patterns of plastic bag bans and plastic bag taxes in the Global South and Global North to contribute to the further refinement of diffusion theory by specifically addressing the under-researched Global South. The article is available for download. Moreover, with an in-depth investigation of plastic bag policies through the lens of diffusion research, the article provides insights in the rather new and still underexplored policy field of plastic pollution. We find that industrialized countries have mostly adopted plastic bag taxes, while developing countries have mainly introduced plastic bag bans and thus more stringent legislation than countries in the Global North. So far, the key driving force for the diffusion of plastic bag policies in the Global North has been the global public pressure. In the Global South, where plastic bag litter is much more visible and harmful due to limited waste collection and recycling rates, national problem pressure has been much more influential. Download: Developing Countries in the Lead — What Drives the Diffusion of Plastic Bag Policies? What Can a Policy Maker do About Marine Litter? Knoblauch, D.; Mederake, L.; Stein, U. Developing Countries in the Lead—What Drives the Diffusion of Plastic Bag Policies? Sustainability 2018, 10, 1994.